The Virgin Australia Film Festival has embraced the use of digital marketing, advertising and the power of Youtube, inviting AFL clubs to create a short film based on the theme ‘extra mile’, which is then featured on the Virgin site, Facebook page and YouTube channel. 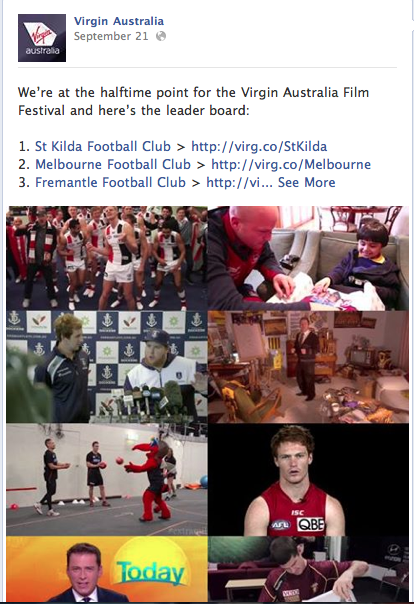 Due to Virgin being the official partner of the AFL, they offered the three club’s who film’s received the most online engagement on the Virgin Australia Facebook page flights for their team to the US for altitude training. This campaign, due to AFL clubs having thousands of followers, would have increased consumer’s awareness of their partnership with Virgin, while also directing and forcing consumers to visit Virgin’s Facebook, YouTube and website ultimately increasing their page views, brand recognition and recall. Many of the videos, while helping to gain more reach for the Virgin brand, also would have a positive effect on the AFL club’s allowing consumers to see a different side of the players and team. My favourite video was the Melbourne Football club, as although they have had a disappointing season they are still able reach out to and help their loyal fans… Take a look. Being a huge AFL supporter i think this campaign is a clever way not only for Virgin to advertise in the digital space, but also the AFL club’s, taking advantage of growing social media trends such as Youtube and Facebook, allowing consumer to get involved, and feel apart of something by having a say. Another smart aspect of this campaign, due to being primarily focused online, is the high engagement and reach that it was able to achieve while being very cost effective. Which AFL club’s video is your favourite? Do you think this is a clever way of advertising for both Virgin and the AFL clubs brands? My heart was definitely touched by the Melbourne football club’s video, that little boy is adorable! I think the way I reacted to it just proved to me how effective the campaign is. I feel like I have a soft spot for Melbourne now! As for Virgin, they were the organisers behind this therefore I have a new found respect for them too for branching out and focusing on other aspects of their business. Interesting post madisone! Thanks, i was very touched by this video also… able to show a different side of the football clubs! But also a very effective campaign for virgin, as the videos ultimately reflect them also. I really liked the St Kilda Ad. Really promoted the brand name digitally however also enraptured the audience through its comedy sign! Great and smart post my friend!